You step into your shower, you slip and grab a hold of your curtain, and yet you fall anyways. It sounds like a scene from a comedy film, but this is something that has actually happened to many people. Most curtains are held up by a rod that normally hangs with nothing more than pressure. Additionally, shower curtains are hard to clean and can become teeming with bacteria, so why not replace yours with a shower enclosure? Shower enclosures are normally made with glass and can be framed with aluminum. They can also feature sliding or pivoting doors, allowing you to decide which makes more sense in your space. Besides being durable, these glass enclosures are also easier to clean. 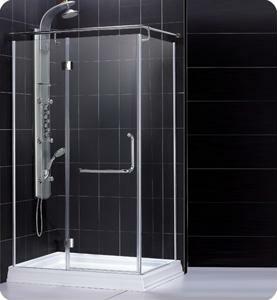 Perhaps what often seals the deal when it comes to shower enclosures is how they look. Because you can see right through them, they don't detract to the overall aesthetic of the space and can go great with a contemporary shower panel. However, if you normally share your bathroom with others who might want to use the bathroom vanity while you're showering, it's best that you purchase the frosted glass variety.